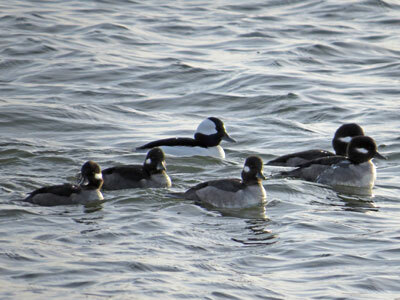 The bufflehead is one of several diving ducks that winter in the Chesapeake Bay watershed. This small, stout duck is often seen together with goldeneyes, hooded mergansers, red-breasted mergansers, surf scoters, long-tailed ducks, and other diving birds. Male buffleheads have a purplish-black head with prominent white patch. Female buffleheads have a brown head with cream colored cheek patch. In the Chesapeake Bay, buffleheads are sometimes known as dippers or dipper ducks, especially among hunters and watermen.